This landmark project involves the shoring of 30,000 sq. 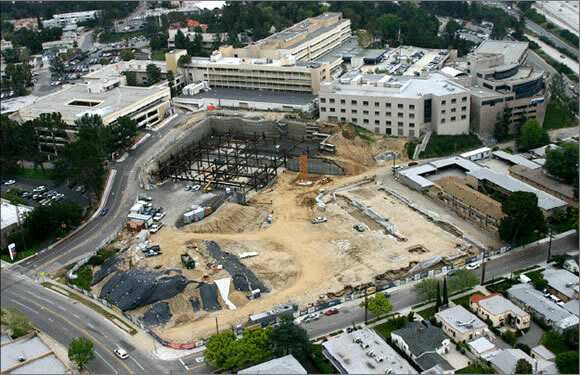 ft. of retaining wall for the new Glendale Adventist Medical Center facility,located in Glendale, California. The facility is situated on a downhill sloping site that has a differential grade of approximately 15-20 feet, from Northeast to Southwest. The design of the building includes a permanent earth retention system, located approximately 3 ft. from the structure, and disassociated from the building. This design alleviated the Medical Center of the necessity of resisting the lateral earth pressures through its Lateral Force Resisting System (LFRS). The project is unique in that no OSHPD approved building had ever utilized a combination Soil Nail, and Soldier Beam and Tie Back system as an integral part of the earth retention solution. Though PB&A had designed a permanent soil nailed wall as part of the University of Southern California Medical Center in the early 1980’s, and the design was approved by OSA at the time, it was not recognized as an approved design by OSHPD, which had yet to come into existence. The unprecedented design required that code language be adopted by the California Building Code (CBC) prior to the approval of plans. As such, Pirooz Barar was tasked with drafting new design criteria for theory, design, construction, and inspection of the Soil Nailing technique that would ultimately be approved by OSHPD and appended to the CBC. 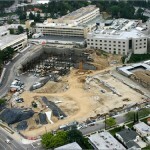 Subsequent to the approval of the design criteria, and the completion of the Glendale Adventist Medical Center project, a similar design is being utilized for a Kaiser Hospital shoring project in Antioch, California.